Welcome to our guide to finding the six best ways to renovate your home and actually increase the value! Fixer-upper homes aren’t just for those handy types who want to save on upfront costs anymore. With the rise of flipper shows, tons of people are rushing out into the housing market and snagging project homes. The aim with all project homes is to gain equity, but fixing up a home is the perfect opportunity to really customize your space–particularly if you plan on making that house your home instead of flipping it for profit. The projects you’ll take on while flipping a home range from merely updating the baseboards and paint to completely tearing out and remodeling a kitchen. While these projects all add value to your home, you’ll want to make sure you spend your budget in the right places to maximize the value you’re adding to your home. The little upgrades can come later, of course. 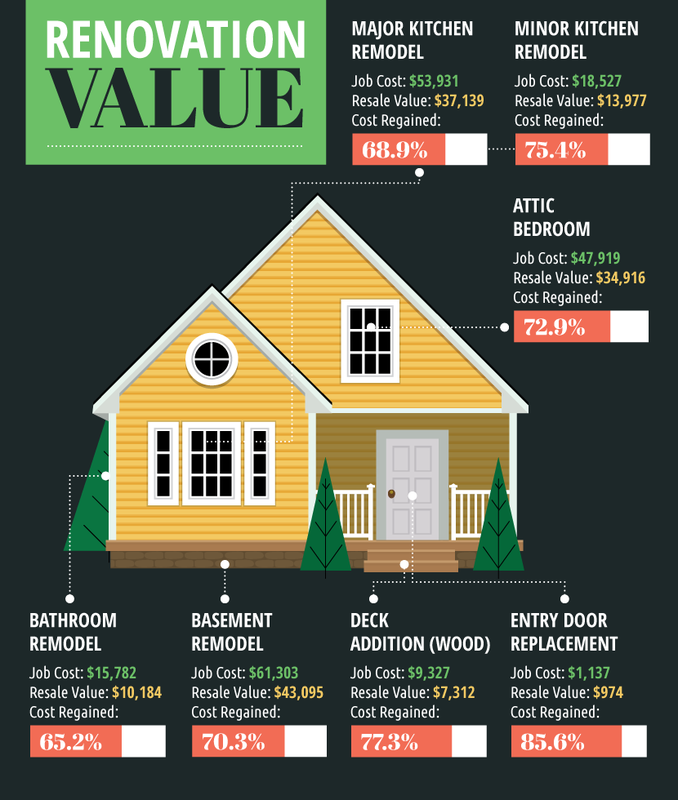 According to HGTV’s numbers, out of each dollar that you spend on renovations, 75 to 80 cents go directly back into your home through the increased value. That’s on average, and doesn’t apply to every project though. We’ve found the secret to six home renovations that will maximize the return on your investment! The kitchen is the heart of your home, and along with bathrooms, is what will sell (or not sell) your house. As such, it will probably be the place where you spend a lot of your budget. The kitchen will be one of the first places that buyers want to see when they walk through your home, as a lot of family time is spent in that kitchen. The easiest and most apparent upgrades you can tackle in the kitchen are for countertops and appliances. If you’re looking to get maximum value for your home, you’ll want to meet and exceed buyer’s expectations. Buyers nearly always expect granite countertops as standard in contemporary kitchens, and while granite is expensive, there are some options that will help you keep your budget down while still giving you a similar look. You can use granite tiles or soapstone as alternatives to granite slabs. Appliances work in a very similar way. Stainless steel appliances add instant value with their classic look. If you’re looking for a more major kitchen renovation, consider swapping out prefab cabinetry with custom-built, solid wood cabinets. If your current cabinets are outdated, or made from cheap materials like melamine, your prospective buyers will probably just see a project they’ll need to take on. 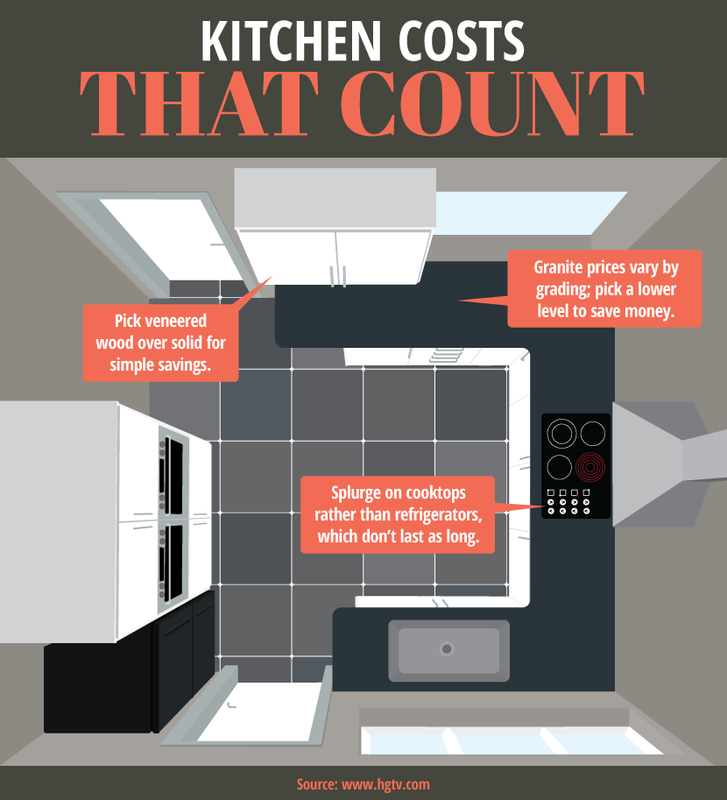 It’s easy to go over budget on a kitchen renovation, so consider your budget carefully when deciding to add extra features like glass cut-outs and soft-close hinges. If your kitchen has a wall that breaks up the continuity of the floor plan, look into having it removed to embrace an open floor plan. This is especially a good idea if your floor plan is a little small. Just be sure that the wall you’re removing isn’t load bearing! If that wall is actually a half wall, you can always consider turning it into a usable bar space instead. Counter space is always a plus! After the kitchen, the next largest portion of your budget should go towards the bathrooms. Bathrooms show their age quickly, so they’re often a source of heartache for homeowners trying to sell. Bathroom renovations add a lot of value to your home without extensive costs, for the most part. Simply decluttering, updating the walls with a coat of paint, or re-grouting can make all the difference in a bathroom. 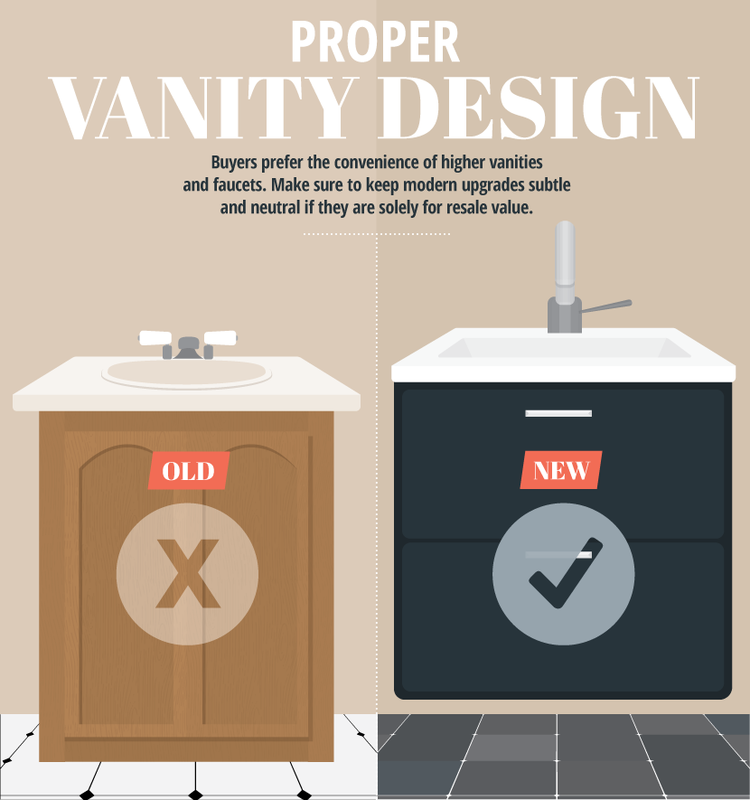 For bathrooms that need a major overhaul, buyers love updated contemporary vanities, tile and stone features and flooring, and glass walk-in showers. If your space can accommodate it, definitely add a walk-in shower, but don’t forget to have at least one bathtub in the house. Without one, you can alienate buyers with children. If a shower-bathtub combination is your only option, be sure you pick a stylish shower curtain. Updating the floors of your home is another amazing and showy way to add value. Outdated vinyl tiles or dirty carpeting are major indicators to home buyers that they’ll need to do a few renovations of their own. Make simple, smart flooring choices that are classic, and you’ll see the difference in value. Depending on your budget, you can choose multiple ways to update flooring. If wood is what you want, you have the options of new or refurbished solid wood, or engineered hardwood. Engineered hardwoods look similar to solid wood, but are less easily scratched. However, solid wood can be refinished many more times than engineered. If you already have wood floors, consider refinishing them before replacing. Dirty, damaged floors can be refinished back to their original glory. Carpet pricing varies depending on the materials, thickness, and padding you choose. If your house seems small, consider adding an addition that you can then convert into an additional bedroom, bathroom, or living space. Dens, offices, attics, and basements can be made complete with the addition of a closet, and then can be touted as an extra bedroom. Keep in mind that all bedrooms need a window large enough to be an emergency exit to be called a bedroom. It does no good to outfit a room as a bedroom if you can’t advertise it when you go to sell. Unfinished attics are a resource you can take advantage of. Finish the room out with drywall, paint, a closet, and a few finishing touches to create a brand new master bedroom. Watch out for basements though. They have a huge amount of space to convert and may not have the same return on investment as an attic space. If there aren’t any spaces you can convert in your home to make it feel larger, simply decluttering, getting rid of heavy drapes in favor of vertical blinds. A sunny room will always feel larger. Staging a room correctly can make all the difference. If your house isn’t in good condition structurally, all the renovations in the world won’t keep the value of your home up. An appraiser will mark off major value points, and a structurally unsound house is likely to scare off any home buyer, as it is a health and safety hazard and a potentially expensive renovation that they will be responsible for as soon as they purchase the home. Additionally, you may have to fix the issues before the buyer agrees to close, or risk legally disclosing the issues publicly in the future. It’s still a buyer’s market for now, so homes that aren’t quite up to snuff are likely to get passed over. It’s critical that everything be in working order–and it should be already, since you probably shouldn’t be living in a home with faulty structuring. If you do find yourself with structural issues, consider replacing pieces with environmentally friendly options. Buyers are becoming more conscious of this trend, and it will save you money and reduce waste in the long run. It doesn’t matter how pretty your home is inside, real estate is always judged by the exterior. Before a buyer can see any of your wonderful renovations, they have to get past the front door, and many buyers will pass over a listing if the landscaping is scraggly or the house needs a fresh coat of paint or new siding. To be blunt, if your home looks as though you don’t take care of the outside, buyers are going to assume you aren’t taking care of the inside either. Updating curb appeal can be as simple as trimming up the landscaping, or as extensive as replacing the entire lawn or xeriscaping with native, drought-resistant plants. To fix up the front facade of your home, fresh paint and clean windows go a long way towards making your home look as inviting as possible. Try installing a new door to make a big statement–the difference will be stunning. You don’t have to put a lot of money into the exterior of your home to get a boost in value. Just make sure you keep it tidy and fresh-looking. If you have the space and budget to add a deck or a front porch, adding one can really boost your home’s value and curb appeal. Having a shaded structure that protects the front door is a big plus in areas with severe or sunny weather. Manicured backyards never hurt either. Adding a deck or patio to your backyard adds purpose and a focal point to a backyard. Definitely worth adding. It’s a bit of a mixed bag of opinions when it comes to lighting renovation projects. If your rooms are well lit, adding new fixtures or dimmer switches won’t really add much value. However, if one of your home’s room is as dark as a cave, a lighting project can be a really fantastic idea. If you are in a hurry to sell your home, look for ways to make your floor plan more open-concept. This style is really popular in the current market, so if you can find ways to take out clunky walls that aren’t load bearing, you are probably going to sell your home quicker. Keep a close eye on the values of the homes in your neighborhood and try to keep the value of your home comparable. At first it might seem like a great idea to out-value the other homes in the neighborhood, but buyers tend to be wary of homes that seem over-priced compared to the other homes in the same neighborhood. It won’t matter if your home is truly more valuable if the other homes cost much less. Remember, if resell value is what is important to you, and is the reason why you’re undergoing renovations, try to conform to style and design guidelines to ensure your home appeals to a wide variety of potential buyers. Of course, if the renovations are just for you, have fun and don’t be afraid to be a little quirky. A renovation is never a waste if it makes you happy.